Going into an interview can be frightening, especially if you haven’t had to sit down for one in a long time. The work industry is always changing, and the days of going into a business and asking for a paper application is becoming a thing of the past. Most companies today require you to complete an application online and send it in, which takes away the opportunity to create a personal connection with the interviewer before the process begins. Getting your application selected for an interview is only half the battle to landing a job quickly. The other half is showing a potential employer why you’re the best candidate for the job. 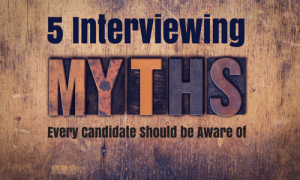 Here are 5 interviewing myths every candidate should be aware of before meeting with a potential employer. Myth 1: You don’t know what will be asked in the interview; therefore you don’t need to prepare for it. You may not know exact questions ahead of time, but preparation is key when getting ready for an interview. Try looking up standard interview questions that may be asked for the type of job you are applying for. Even more importantly, look up the company you want to work for. Most interviewers will question why you want to work for the company or what you might already know about it. Having an answer will show not only that you’re prepared and taking the interview seriously, but also that you would be a great fit for their organization. Myth 2: You have to know the right answer to every question. As long as you try and understand what an interviewer is asking and put some thought into your answers, an employer will look at how you approach the questions, rather than whether or not you answer the questions perfectly. Problem solving and analytical thinking are more important to success than knowing the answer to every question. Myth 3: You have to be the most skilled candidate to get the job. Of course skills and qualifications are necessary for any job, but most interviewers look at what you can bring to their organization as a whole. Having a positive personality and showing them you are willing to learn can make all the difference in whether or not you get the position. Myth 4: You don’t need to do anything after the interview. You want to make sure you have the edge over any other potential candidates. You can do this by reaching out to the interviewer, whether by email or telephone. Let them know how much you enjoyed speaking with them and that you look forward to hearing from them soon. By doing this, you will show your enthusiasm for the job, and the initiative will help you stand out from candidates that are similarly qualified. Myth 5: You don’t need to put too much effort into your appearance. When going into your first interview, you want to make sure to dress for success. Even if you’re applying for a job you know has a more casual work environment, you want to let potential employers know you put thought into your interview from beginning to end. Let the interviewer be the one to tell you about the dress code requirements, or let it be one of the questions you ask at the end of the interview. Not only does dressing well and having yourself groomed boost your confidence, it also shows an employer that you take pride in your appearance. If you’re struggling to land a job offering more growth opportunities, The Jobs Partnership can help you acquire the skills and resources you need to succeed. Whether you have been applying to jobs that aren’t a good fit for your personality or your interviewing skills are lacking, our LifeWorks program can help. Through partnerships with companies, professional coaches, and churches, LifeWorks provides a no-cost, 12-week training course to help you discover the job you were made for. Call us at 407- 641-0755 or apply here to get started on the pathway to success.